Finance Minister Tito Mboweni faces one of the most difficult tasks of his career so far as he delivers his maiden budget speech amid very weak economic growth, high unemployment and floundering SOEs. Mboweni is delivering his maiden budget this Wednesday afternoon. Mboweni could announce measures to stabilise Eskom, SAA and the possibly the SABC. The SABC will be streaming the budget live on its YouTube channel. Tax expert, Redge de Swardt, says it’s unlikely that Finance Minister Tito Mboweni will raise taxes – when he delivers the Budget speech this afternoon. During last year’s Budget speech, the VAT rate went up from 14 to 15 percent. De Swardt elaborates on his expectations for South Africans’ personal income tax, corporate tax and VAT. “I think it is unlikely that these three taxes will have any significant increases and I think we need to take into account that these are the three main sources of revenue for the government. Our personal income tax is already on 45 per cent and it has been there for the last few years. So we are already on a very high personal income tax rate. 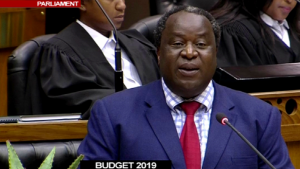 The post Mboweni delivers his maiden budget speech appeared first on SABC News – Breaking news, special reports, world, business, sport coverage of all South African current events. Africa's news leader..